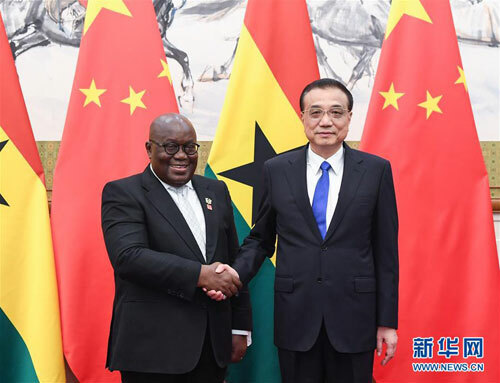 BEIJING, Sept. 1 ,Chinese Premier Li Keqiang on Saturday met with Ghanaian President Nana Akufo-Addo who is on a state visit to China, and to attend the 2018 Beijing Summit of the Forum on China-Africa Cooperation. The two sides should expand cooperation on production capacity, enhance the facilitation of investment and trade, and deepen cooperation in human resources, agriculture, and fisheries, Li said. Noting the bilateral cooperation has improved Ghana's infrastructure, Akufo-Addo said the Ghanaian side is ready to sign a bilateral investment protection treaty as soon as possible to promote the ties to a higher level.